The oakleaf hydrangea (Hydrangea quercifolia) is a native American shrub. It is slow-growing and deciduous, and thrives in the temperate climates of Florida to Tennessee, and west to the Mississippi. The oakleaf hydrangea grows to 6 feet tall and wide. Its bark turns a cinnamon color as it ages, and its deeply lobed leaves turn bronze in the fall. While the oakleaf hydrangea is a fairly easy shrub to grow, there are some diseases that can affect it. Oakleaf hydrangeas grow in containers are most susceptible to phytophthora root rot, mainly because of poorly drained potting soil and/or too much watering. Symptoms of this fungal disease include sudden wilting, yellow foliage, stunted growth and leaf shed. The small, feeder roots of diseased plants will be brittle and brown. Eventually, the plant's shoots and stems will turn a mushy brown. Avoid phytophthora root rot by buying disease-free plants, planting in well-drained areas or raised beds, and, if necessary, using a fungicide. Cercospora leaf spot is rarely fatal, but it causes heavy spotting of the leaves and leaf shed, both of which can injure your oakleaf hydrangea and reduce the number of flower buds. Symptoms include small, angular purple or dark brown spots that first appear on foliage near the plant's base and then spreads upward. The leaves with a heavy infestation will turn yellow-green and drop. The fungus is spread to healthy leaves by splashing water, and it's frequently found during rainy summers. To avoid or slow development of cercospora leaf spot, remove diseased leaves, ensure the plant has adequate nitrogen and water with drip irrigation at the soil surface to avoid splashing. Mushroom root rot (also known as Armillaria root rot) is quite common among oakleaf hydrangeas. The fungus is found in many shrubs and trees, including oaks. Oakleaf hydrangeas that are stressed by drought are particularly susceptible. The earliest symptom is the sudden wilting of one or more shoots, which do not return to normal after watering. The rest of the shoots will wilt within a few weeks, killing the plant. In the late fall, sunken lesions may appear at the root collar. According to the Alabama Cooperative Extension System (ACES), clusters of up to 100 honey-colored mushrooms may appear after a heavy rain on the hydrangea's damaged roots or within the shrub's drip zone. Adequate watering, avoiding sites where other plants have encountered mushroom root rot, consistent fertilizing and removing dead or diseased plants will help keep the fungus at bay. Fungicides will not work, ACES says. Botrytis blight, also called gray mold, appears on oakleaf hydrangea flower buds and blossoms. Cool, humid, rainy weather with overcast skies are ideal conditions for the disease. 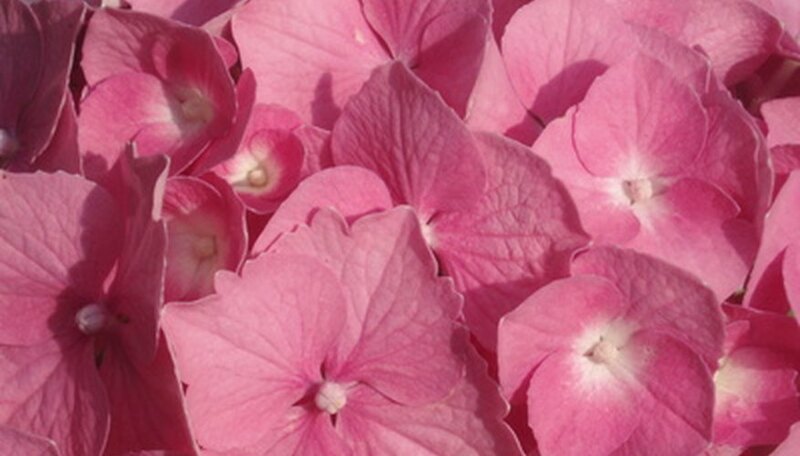 Small, water-soaked spots will appear on the hydrangea flower's petals. They quickly spread into reddish-brown blotches. The plant's petals will turn brown and wither, becoming covered with a mass of fuzzy, gray spores. The botrytis blight fungus can survive almost indefinitely in plant debris, and its spores are easily spread by wind. Infected flowers, leaves or even entire plants should be placed in the trash or burned on a dry day. Never compost any infected part. Fungicide sprays can protect the hydrangea from infection.